It’s safe to say that all families can stand to eat a little healthier, but it’s hard to eat healthy today. With families always on the go, both parents working, the kids in school and activities after school, it’s hard enough to get the family together for dinner, let alone have the time to eat a healthy meal. Families today don’t have the time to spend a lot of time on food preparation. They want quick and simple meals that are healthy and will provide them with the fuel they need to manage their busy schedule each week. Unfortunately, too many people turn to fast food and less healthy meal options when they are short on time. This often leads to relying on diets to pull the reins back and get back on track when it comes to eating healthy. These yo-yo diets don’t work. Making a lifestyle change is the best way to improve your health and stay healthy for the long term. 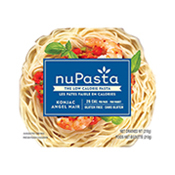 Make NuPasta part of your household menu and help you on your journey to eat healthy. 1. It’s a low calorie option: Most of us eat too many calories each day. We tend to eat high calorie foods, such as regular pasta. Rather than going on a diet, making a few changes to our eating habits, such as replacing high calorie foods with low calorie alternatives is a great way to cut calories. 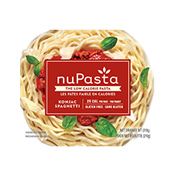 A full plate of NuPasta can satisfy your hunger, yet it has only 1/10 the calories of traditional pasta. 2. It’s high fibre: Most Canadians do not eat enough fibre in their diet. 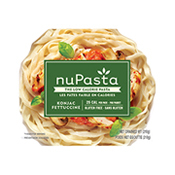 NuPasta has 3 times the fibers of that of traditional pasta. 3. It’s vegan and gluten free: More and more people are realizing they have a gluten allergy or intolerance, and an increasing number of people are choosing to eat a vegan diet. 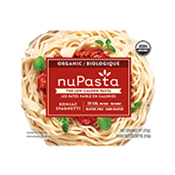 NuPasta is both vegan and gluten free, making it a great meal option for people with these food requirements. 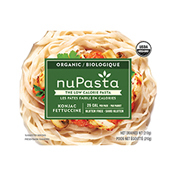 Include NuPasta in your diet and you will be well on your way to reducing your calorie intake, increasing fibre in your diet, and eating healthier.